Turns out being a bridesmaid comes with lots of arts and crafts projects. To some, that sounds really annoying. To me, it’s a dream. All the things I have been pinning for years can finally be brought to life! I can even make my own pin-worthy things!!! First stop on the bridesmaid train was the bridal shower. All the bridesmaids decided to make a themed gift basket that would be used as the prizes for the bridal shower games. 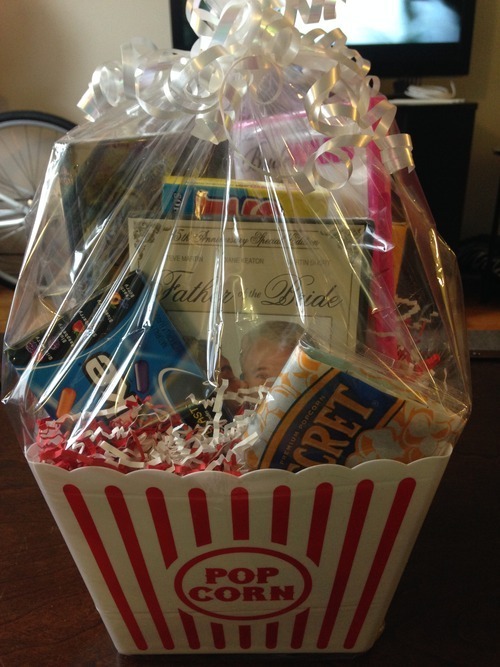 Being the movie buff that I am, I went with the movie-themed gift basket. First we need the contents of the basket. I decided to include some DVDs, popcorn, and classic movie candy. 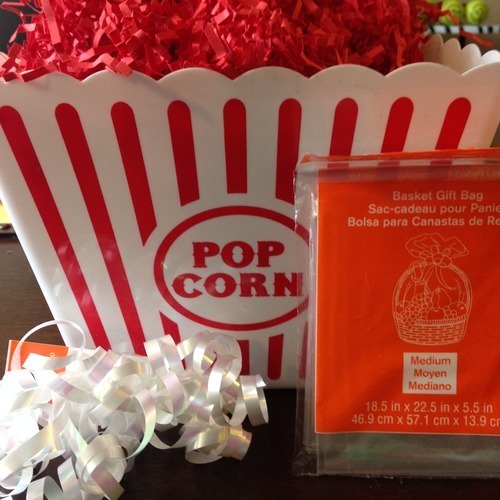 Depending on the price of the basket you could also include a gift card to the movies. As you can see, I stuck with a theme and added only bride movies — Bride Wars, Father of the Bride, and The Princess Bride. 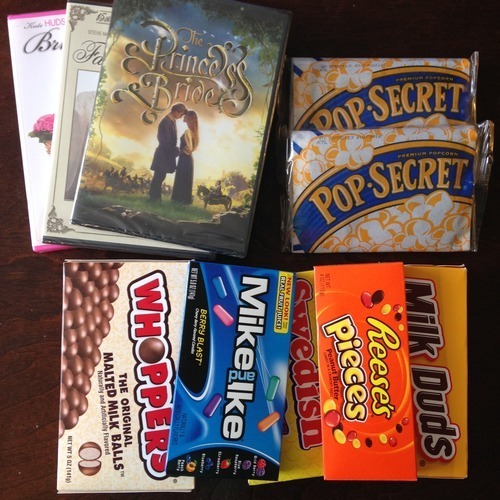 The popcorn and candy I picked up at the supermarket and the movies were easy enough to find on Amazon. Using the shredded paper, I stuff the basket to add a little height. 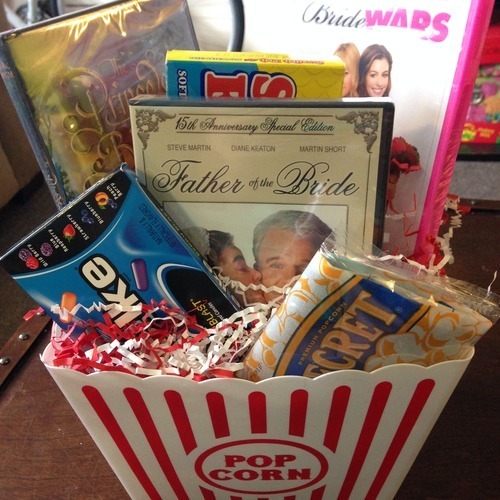 I then positioned the movies, popcorn and candy in a way I thought would look nice for the basket, keeping in mind that the back would be on display as well. In order to keep things in place, I just stuck extra shredded paper between the loose areas. Everything stayed in tact pretty well! Finally I needed to wrap it. I carefully places the basket inside the plastic bag and tied a knot at the top with the ribbon. There was a little too much plastic bag sticking out on the sides so I taped it down with clear, double-sided tape. Seeing as this was my first gift basket, I was pretty happy with the result! It looked really nicely put together and the person who won it was excited about the contents! What themed basket would you have chosen? 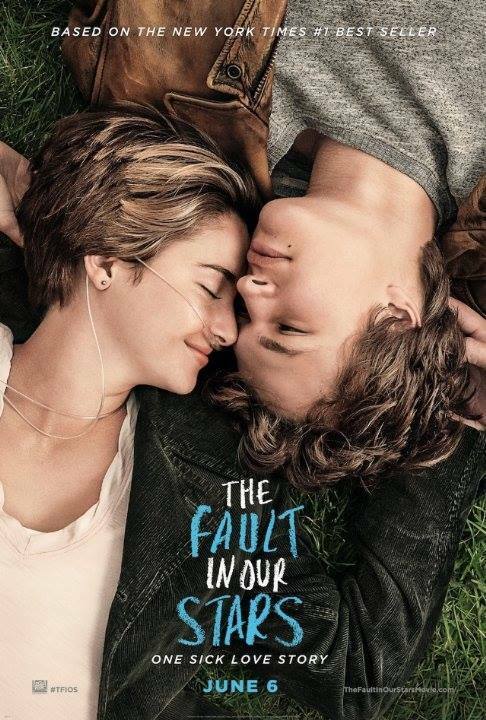 My heart is melting… I can’t wait for this movie. My favorite part of Halloween is making my own costume. 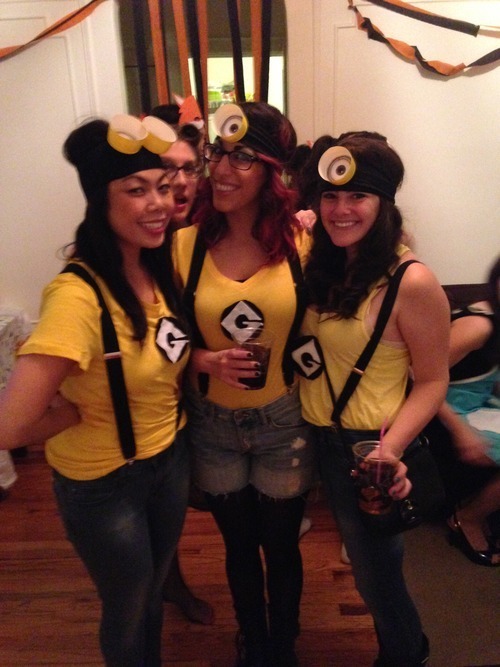 This year I decided to be a minion from the movie Despicable Me. I have a knack for taking things that wouldn’t necessarily be cute (i.e. costumes for boys) and making them awesome. 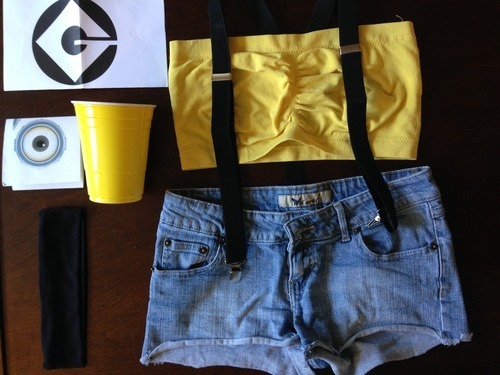 Take a look at the world’s easiest costume. 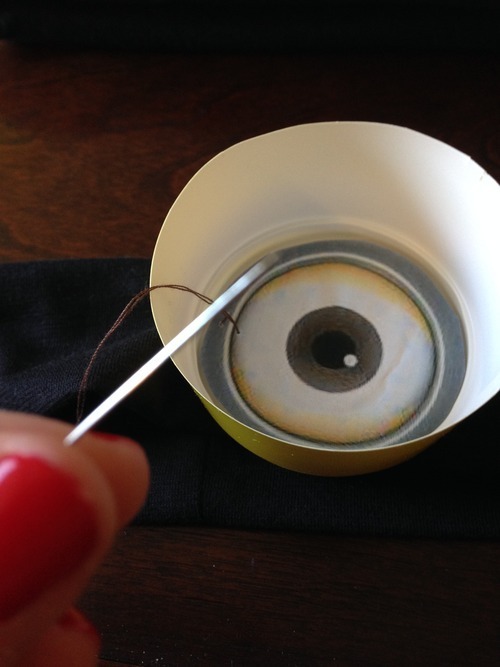 Let’s start with the eyes since this essentially the whole costume. If you google “minion eyes” you will get a ton of results. Print out one (or two) and cut it out. Take your solo cup and cut it down to the first line. 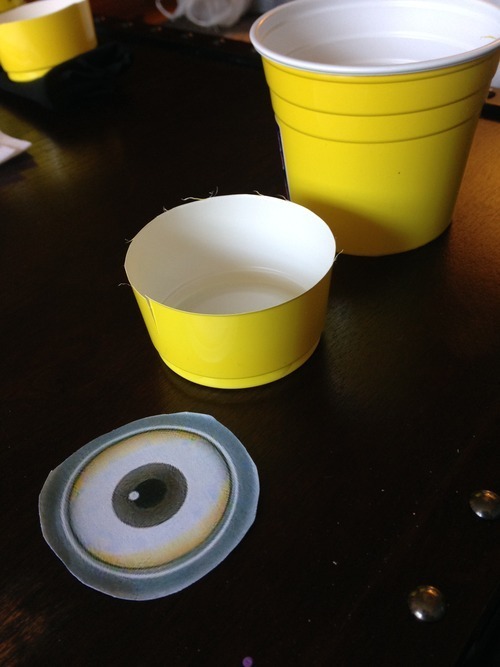 You can then glue your eye(s) into the cup. Next, grab your headband. We need to attach the solo cup to the headband. You can do this with staples but I chose to sew them in! Boom. Your eyes are done. Now we need a Gru logo so there is no mistake of which villain you work for. I found the logo online (google!) and printed it out. I then pinned it to some felt and cut out the shape. You’ll need both black and white felt for this. One sheet of each from Michaels is more than enough! 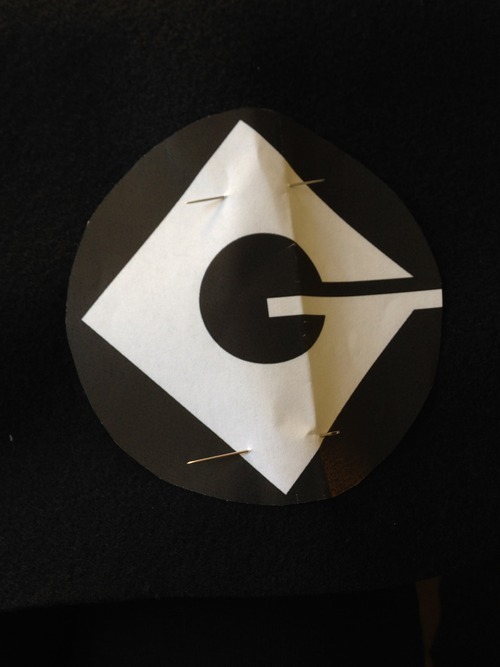 Once you have cut out your logo, you can safety pin or sew it to your yellow shirt (or front of your overalls if you have them). Put everything on and…. TADA! You’re a minion! Are you adorable? CHECK! Did you spend a lot of money? NOPE! Congrats and happy Halloween! The Last 5 Years – Team Jamie or Team Cathy? I saw this incredible broadway show, The Last 5 Years, and just cannot stop thinking about it. The story follows a couple, Jamie and Cathy, and their five year journey. Sadly, the show is ending its run but there will be a movie adaptation (starring Anna Kendrick!). Of all the people I’ve spoken to about the show, there seem to be pretty different opinions about what went down in this relationship. The question is, are you Team Jamie or Team Cathy? Spoilers below if you don’t want to know about this story! So the gist of the story follows the crumbling relationship of this couple, however both characters start on opposite ends of time. The show begins with Cathy in the present, devastated that their 5 year relationship is over and Jamie just meeting Cathy pretty much falling in love at first sight. They meet in the middle and get married and the show ends with Jamie leaving Cathy while Cathy is excited just after their first date. Frankly, I see both sides. I see how some people blame Cathy for the demise of this relationship and vice versa. Cathy was super jealous. You see her overreacting and being jealous about other women that Jamie works with. You also see her not really trying like when she refuses to come to Jamie’s book party. It was Cathy who suggested moving in together in the first place and it all happened super quick. Cathy chose the rough career path of acting and she was struggling. She was never able to get over that Jamie was super successful while she wasn’t. One of the main things Jamie says that really makes you sympathize with him is when he tells her, “I’m not going to fail because you can’t win.” If Cathy was a little more supportive they could have made it work. It took Jamie all of one song to be less than excited about being married. Immediately after the wedding he began looking at other women and fueling Cathy’s jealousy. Sure, he called her and said all the right things but his heart wasn’t in it. It makes you wonder whether he was ever really into it. He admits that it was all moving a little too fast and that maybe they should slow down but he never let’s Cathy know that everything isn’t perfect until it’s too late. He leaves her on her birthday. He cheats on her. He cares only about his own career. And then he leaves her. Okay fine. I’m clearly Team Cathy. Overall, the show was beautifully tragic. The music was amazing, the comedy was there, but it was an emotional roller coaster. Did you see the show? Who’s side are you on?